"The miracle took place in the small Peloponnesian town of Filiatra in 1943, during the dark days of the occupation of Greece by the Germans. This miracle has moved and continues to move, to this today, not only the people of Filiatra but also the people of all Greece. From the German Headquarters in Tripoli, orders were issued to Officer Kondau, in charge in Filiatra, to burn the town, because of a sabotage that the rebels had instigated. The Commandant was ordered to kill a certain number of notable Filiatrians, to take as prisoners the 1,500 other citizens, and to send them to Germany, after which it is was obvious they would never return. Officer Kondau, feeling no pity, in turn, gave the orders to his soldiers to follow through with implementing the destruction, on the following day at 6:00AM in the morning. In Tripol, the Priest, Archimandrite Theodore Kotsakis, who was originally from Filiatra, learned of this plan. Grief and worry overcame everyone; no one knew what to do to save Filiatra and its people. So, the priest Theodore found someone who knew German, and together they went to the house of the German Officer in Tripoli. But while they waited outside his office, loud voices, cursing and a great upheaval were heard. A Greek woman pulled on the priest's cassock, urging him to leave, so that they might not be killed there, right on the spot! Thereby, upon leaving, the Priest notified all the people from Filiatra who were living in Tripoli, to pray that night to Saint Charalambos, who was Patron Saint of Filiatra, asking him to intercede for the town and its people. Then the Priest Theodore closed himself in his room and prayed with much pain and sorrow. And the citizens of Filiatra did the same, as they had caught wind of something going on, themselves. Saint Charalambos heard their prayers and performed the miracle! The Saint then appeared that night to Officer Kondau while he was sleeping. He appeared to him as a serious, old and dignified man of holy countenance, dressed in priestly robes and having a long white beard. This German conqueror, who was a protestant, had never seen such a face or such an appearance ever before in his life. The solemn Elder then said to him with such sweetness: "Listen, my son, do not carry out the orders you were given." The dream was so real that it created a great impression on him. He awakened suddenly and then went back to sleep, but, with determination, however, to carry out the order he was given. Then once again the Saint appeared to him in his sleep and said: "That which I have told you to do, do it. Do not execute the order. Do not be afraid. I will make sure that you are not punished." Again, he awakened, and the words spoken to him were whirling around in his mind. But it was impossible for him not to carry out the order, after all the Germans would execute him if he didn't. Once again he fell asleep. And once again the solemn Elder appeared to him for a third time, saying: "I told you not to be afraid. I will see to it that you are not punished. I will protect you and all your men. You will all return to your homes and nothing will happen to you." At first, the Commandant wanted to ignore the order of Saint Charalambos, in order to appear the giant. But despite all his intransigence, he yielded, because afterwards, as this German Officer himself related, he heard in his sleep shouts and cries, as if coming from people being tortured right in his own courtyard. Then, real life figures appeared like women, many women, who were beating themselves on the heads and chests out of unbearable misfortune and pain. They were mourning, showing desperation, and cursing, out of agony in anticipation of the slaughter of their children and grandchildren that was to take place. All of these voices then became like a big cloud that ascended on high, into the heavens, without anything falling to the earth. And furthermore, as he slept, the German Officer saw long black clouds that were coming out of his room, ascending, and casting a shadow upon the sun, with the sun trying to hide from the clouds as if it were a person who in turn was casting shadows on the faces of his soldiers. Some of soldiers were afraid, while others were asking for help as they made the sign of the cross. And still others were running and hiding behind the olive groves. From his fright he woke up. He tried to speak but couldn't, rather his mouth was agape as he looked at the image in his dream, the old man that he saw three times in his dream who had the appearance of a Saint of the Orthodox church. When he came to his senses, he began thinking of the evil that was about to happen: the slaughter of human beings, like dogs to remain on the streets without burial and of houses burning in seconds which had taken centuries to be built! These reflections stirred him. But still he said to himself: "I said I was going to burn this town and burn it I will!" Then he closed his eyes. And the old man, Saint Charalambos, appeared once again before him, in a threatening and persistent manner. In a loud and emphatic voice, the Saint said to him: "Be careful! This town is not going to burn and its people are not going to be captured. They are innocent. Do you hear me?" The German Officer stood up, steadied himself, as his knees were shaking from fright and he picked up the telephone. With a trembling voice, he called Tripoli to speak to the German Commandant of all Peloponesos. And when this commandant tried to respond to give orders, he faltered. He tried to get fierce so that his orders would be carried out, but he wasn't able to! So what was going on? That same night he also had also seen Saint Charalambos in his sleep, just as the Officer Kondau from Filiatra had described him on the telephone. And finally, the Commandant resolutely told the Officer in Filiatra: "Write this down. I am suspending the destruction of the town. Come immediately to see me tomorrow at noon!" One battalion, then, of German soldiers with Officer Kondau and two Orthodox priests in the middle, walked down the street going from Church to Church. 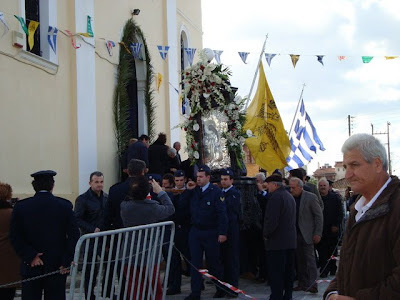 They started at Saint John's, then Saint Nicholas', then Saint Athanasios' and finally headed for the Church of the Panagia (The All holy one). Officer Kondau was searching for the icon of the Saint that he saw in his dream. When they opened for him he door of the Temple of the Panagia, he recognized among the icons, Saint Charalambos, whom he had seen in his dream, who had commanded him. His voice broke. He became ashamed of his pride. He hid his face with his hands. Shortly, he lowered them. And this Protestant, on bended knee, made the sign of the cross. He uttered a few prayers in his own language, of which the priests present were unable to interpret. Afterwards, he asked the priests to tell him who this geronda (elder) depicted in the icon was. They related to him that it was Saint Charalambos who bore many torments for Christ. Then they told him of the many miracles that the Saint had performed, and still does to this day. There are no words to describe the joy felt by the people of Filiatra and their gratitude toward the Saint. They glorified God and they thanked Saint Charalambos for the miracle. And just as the Saint had told Officer Kondau, the leader of the garrison, and all his men, after the war was over, they returned safely to Germany and to their homes, without anyone being harmed. The German Officer, thus, preserved vividly the memory of this miracle and showed gratitude to the Saint. He hoped to return from Germany to venerate him. And in fact, after two years, he came with his wife to the town of Filiatra. But, on his first pilgrimage, he didn't quite make it for the Feast Day of the Saint. He came one day later, on February 11th. When, however, the people of Filiatra saw him, they were so overjoyed that they celebrated the Feast Day all over again. They chanted the doxology; they held receptions and dinners and other festivities. And up until recent times this German Officer with wife and family and other countrymen have come on the 10th of February to the town of Filiatra to venerate and pay homage with faith to this Saint. In their hearts Orthodoxy had blossomed [i.e. they converted to Orthodoxy]. 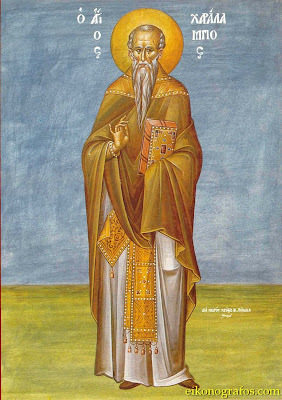 O wise Haralambos, you were proven an unshakable pillar of the Church of Christ; an evershining lamp of the universe. You shone in the world by your martyrdom. You delivered us from the moonless night of idolatry O blessed One. Wherefore, boldly intercede to Christ that we may be saved. Holy Saint Charalambos Pray to God for Us!" Beatiful, beautiful story... We have a church dedicated to Saint Haralampos in Plovdiv, Bulgaria.